provide the most attractive and reliable heavy-duty door control available. Provide a wide range of optional features, and are ideal for use on entrance and vestibule doors, large doors, doors opened frequently, or doors subject to abuse. These models are also furnished with an offsetstyle jamb bracket. Designed for heavy-duty applications, 100 Series models will provide long-lasting protection to doors, frames, hinges, related hardware and surrounding walls or obstructions. Hold-open (H) models should be used where it is desired to hold a door open at a predetermined position for short or long periods of time, permitting an unobstructed traffic flow through the opening. These models are both selective and adjustable, featuring the most reliable hold-open mechanism available. They feature a control knob which protrudes from the face of the door and turns the hold-open function on or off. Set in the inactive position, the unit acts as a stop and shock absorber. The tension on the hold-open mechanism can be adjusted using an allen wrench to offset air currents or other exterior conditions. The hold-open tension adjustment is located in the bottom of the track in the top of the door. Friction hold-open (F) provide an alternative holding method, ideal for heavy patient room doors, closet doors or similar applications where multiple hold-open positions are desired. The friction tension is adjusted using an allen wrench and an open end wrench. The friction tension adjustment is located on the top of the slider in the channel. Stop-only (S) When the hold-open function is not required, the stop-only function provides the same effective door control minus the hold-open feature. The stop-only model may be used on fire doors. 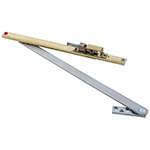 Special stop-only (SE) When stop-only models are used in conjunction with single point hold-open electronic door closers, they may be ordered without the shock-absorbing mechanism. Used as an auxiliary stop with these closers, they will prolong the life of the closer. The stop location is adjusted using an allen wrench on the stop block located in the channel. Note: Caution should be taken when using this option in other applications, as the elimination of the shock-absorbing spring can put added stress on the door and frame. Classification: Stop-only models are classified as Miscellaneous fire door accessories. This classification applies to use on either hollow metal fire doors or wood fire doors. Material substrate: Heavy gauge brass or 300 Series stainless steel, these models offer the broadest range of finishes in the industry, complementing any design and offering the highest resistance to corrosion.